Hello from Solartech on this wonderful sunny day in May (or depending on when and where you are reading this)! It’s getting closer to that time of the year when vacations start and we get to have fun in the sun! But who cares about fun when you have SQL 2016 to prepare for? Ha! Just kidding… Kind of. Ok, really SQL Server 2016 is coming soon so let’s talk about what new features we can expect. Let’s take a quick recap of SQL Server 2012 and 2014 (recent versions that have come out). SQL Server 2012’s features included a set of options to improve database availability, contained databases which simplified the moving of databases between instances, programmability enhancements, metadata discovery, improved role management, etc. But if you want to know more about this version of SQL, click here to read all about this new upgrade courtesy of the team at Microsoft! Ah, now that it’s Friday, and I’ve wracked my brain trying to comprehend all this information – once again courtesy of Microsoft articles – that you IT people do day-to-day, I’m going to sit back and relax and daydream about the Bahamas. Cheers from Solartech and Enjoy SQL Server 2012, um 14, er… I mean 16! 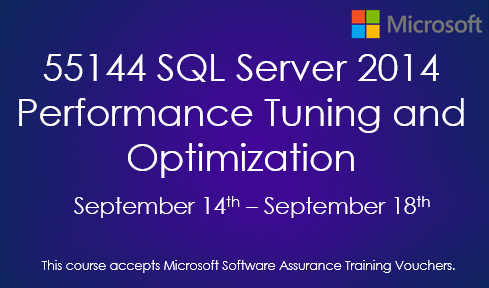 Join us September 14th for 55144 SQL Server Performance Tuning & Optimization training! This five day training course by Solartech is designed to give the right amount of Internals knowledge, and wealth of practical tuning and optimization techniques, that you can put into production. The course offers a comprehensive coverage of SQL Server architecture, indexing and statistics strategies, optimize transaction log operations, tempdb and data file configuration, transactions and isolation levels, and locking and blocking. The course also teaches how to create baselines and benchmark SQL Server performance, how to analyze workload and figure out where performance problems are, and how to fix them. Coverage of in-memory tables and stored procedures along with an introduction to this exciting new technology is included. To view the full course outline please click here. Attend in-person or online and Microsoft Software Assurance training Vouchers are accepted! SQL Server 2008 is Microsoft’s latest version of SQL Server. SQL Server 2008 strives to have zero downtime through being a self-sufficient server. It does so through the development of SQL Server Always On technologies. This technology makes data management self-tuning, self organizing and self maintaining. Or if you’re interested in taking classes on SQL Server 2008, you can find a list of classes here or you can email me, Michael Hacker at mhacker@solartechnj.com for additional information.